This post will be about pre-processing custom indicators in quantstrat–that is, how to add values to your market data that do not arise from the market data itself. The first four parts of my nuts and bolts of quantstrat were well received. They are even available as a datacamp course. For those that want to catch up to today’s post, I highly recommend the datacamp course. To motivate this post, the idea is that say you’re using alternative data that isn’t simply derived from a transformation of the market data itself. I.E. 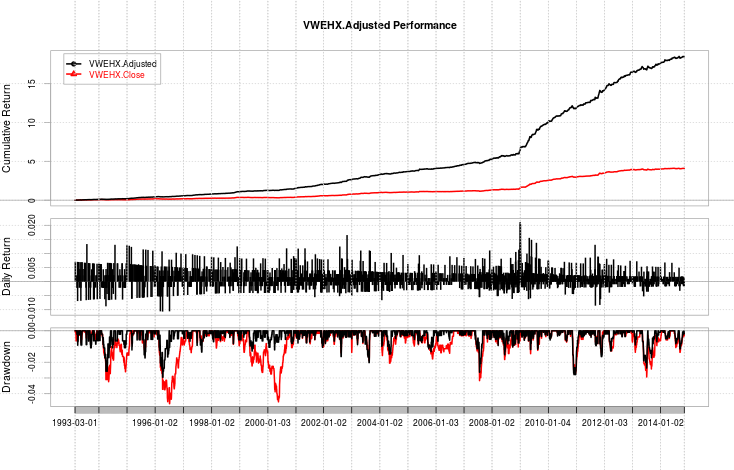 you have a proprietary alternative data stream that may predict an asset’s price, you want to employ a cross-sectional ranking system, or any number of things. How do you do this within the context of quantstrat? The answer is that it’s as simple as binding a new xts to your asset data, as this demonstration will show. First, let’s get the setup out of the way. Now, we have our non-derived indicator. In this case, it’s a toy example–the value is 1 if the year is odd (I.E. 2003, 2005, 2007, 2009), and 0 if it’s even. We compute that and simply column-bind (cbind) it to the asset data. Next, we just have a very simple strategy–buy a share of SPY on odd years, sell on even years. That is, buy when the nonDerivedIndicator column crosses above 0.5 (from 0 to 1), and sell when the opposite occurs. strategy.st <- portfolio.st <- account.st <- "nonDerivedData"
In conclusion, you can create signals based off of any data in quantstrat. Whether that means volatility ratios, fundamental data, cross-sectional ranking, or whatever proprietary alternative data source you may have access to, this very simple process is how you can use quantstrat to add all of those things to your systematic trading backtest research. Note: I am always interested in full-time opportunities which may benefit from my skills. 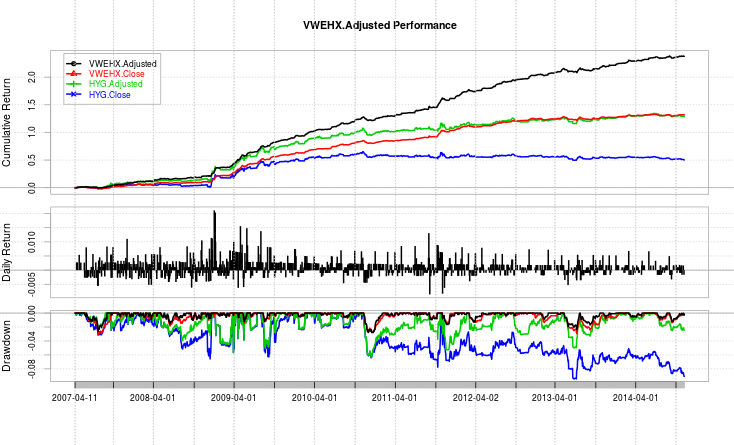 I have experience in data analytics, asset management, and systematic trading research. If you know of any such opportunities, do not hesitate to contact me on my LinkedIn, found here. So after reading the last post, the author of quantstrat had mostly critical feedback, mostly of the philosophy that prompted its writing in the first place. Basically, the reason I wrote it, as I stated before, is that I’ve seen many retail users of quantstrat constantly ask “how do I model individual spread instruments”, and otherwise try to look like they’re sophisticated by trading spreads. The truth is that real professionals use industrial-strength tools to determine their intraday hedge ratios (such a tool is called a spreader). The purpose of quantstrat is not to be an execution modeling system, but to be a *strategy* modeling system. 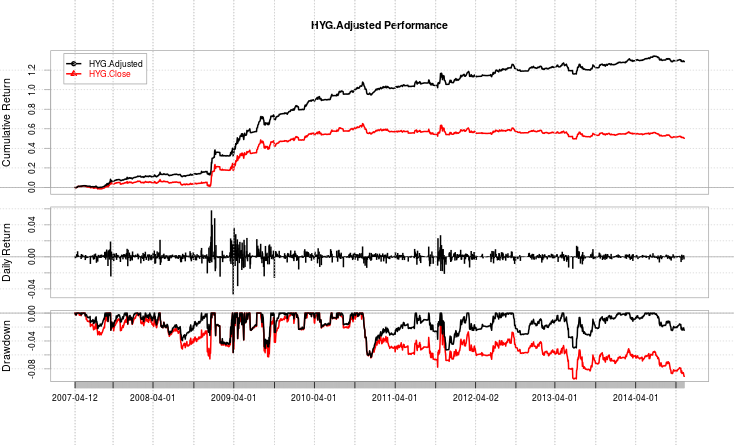 Basically, the purpose of your backtest isn’t to look at individual instruments, since in the last post, the aggregate trade statistics told us absolutely nothing about how our actual spread trading strategy performed. The backtest was a mess as far as the analytics were concerned, and thus rendering it more or less useless. So this post, by request of the author of quantstrat, is about how to do the analysis better, and looking at what matters more–the actual performance of the strategy on the actual relationship being traded–namely, the *spread*, rather than the two components. strategy.st <- portfolio.st <- account.st <-"spread_strategy_done_better"
In this case, things are a LOT simpler. Rather than jumping through the hoops of pre-computing an indicator, along with the shenanigans of separate rules for both the long and the short end, we simply have a spread as it’s theoretically supposed to work–three of an unleveraged ETF against the 3x leveraged ETF, and we can go long the spread, or short the spread. In this case, the dynamic seems to be on the up, and we want to capture that. In other words, the typical profile for a trend follower, rather than the uninformative analytics from the last post. Furthermore, the position sizing and equity curve chart actually make sense now. Here they are. To conclude, while it’s possible to model spreads using individual legs, it makes far more sense in terms of analytics to actually examine the performance of the strategy on the actual relationship being traded, which is the spread itself. Furthermore, after constructing the spread as a synthetic instrument, it can be treated like any other regular instrument in the context of analysis in quantstrat. In this post, I’ll attempt to address a question I’ve seen tossed around time and again regarding quantstrat. First off, a disclaimer: this method is a bit of a kludge, and in using it, you’ll lose out on quantstrat’s inbuilt optimization functionality. Essentially, it builds upon the pre-computed signal methodology I described in a previous post. Essentially, by appending a column with the same name but with different values to two separate instruments, I can “trick” quantstrat into providing me desired behavior by modeling trading on two underlying instruments. So, as you can see, we have a spread that drifts upward (something to do with the nature of the leveraged ETF)? So, let’s try and capture that with a strategy. The way I’m going to do that is to precompute a signal–whether or not the spread’s close is above its EMA20, and append that signal to UNG, with the negative of said signal appended to UGAZ, and then encapsulate it in a quantstrat strategy. In this case, there’s no ATR order sizing function or initial equity–just a simple 3 UNG to 1 UGAZ trade. strategy.st <- portfolio.st <- account.st <-"spread_strategy"
So, did our spread trade work? Sort of. However, when you think about it–looking at the statistics on a per-instrument basis in a spread trade is a bit of a red herring. After all, outside of a small spread, what one instrument makes, another will lose, so the aggregate numbers should be only slightly north of 1 or 50% in most cases, which is what we see here. 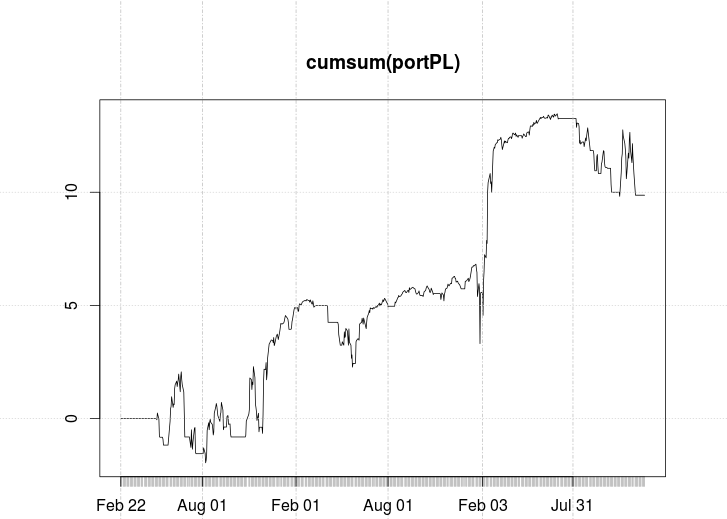 A better way of looking at whether or not the strategy performs is to look at the cumulative sum of the daily P&L. 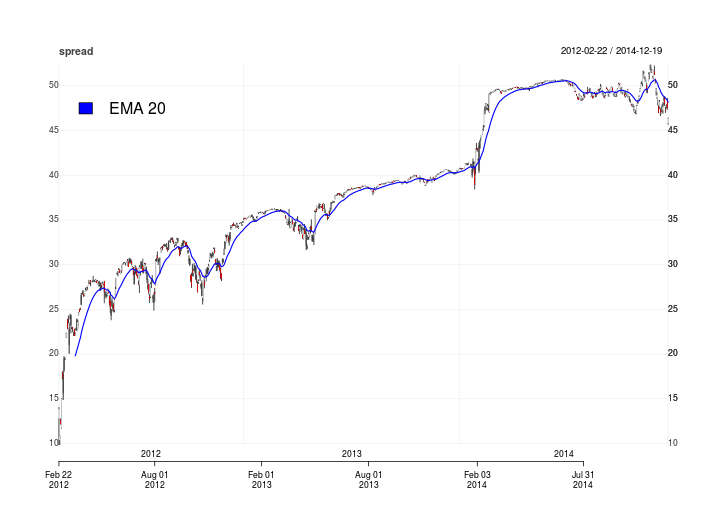 Is this the greatest equity curve? Probably not. In fact, after playing around with the strategy a little bit, it’s better to actually get in at the close of the next day than the open (apparently there’s some intraday mean-reversion). Furthermore, one thing to be careful of is that in this backtest, I made sure that for UNG, my precomputedSig would only take values 1 and 0, and vice versa for the UGAZ variant, such that I could write the rules I did. If it took the values 1, 0, and -1, or 1 and -1, the results would not make sense. In conclusion, the method I showed was essentially a method building on a previous technique of pre-computing signals. Doing this will disallow users to use quantstrat’s built-in optimization functionality, but will allow users to backtest individual leg execution. To answer one last question, if one wanted to short the spread as well, the thing to do using this methodology would be to pre-compute a second column called, say, precomputedSig2, that behaved the opposite way. In this case, the first thing to note is that as quantstrat is an R library, it can also incorporate basic programming concepts into the actual strategy formulation. In this case, depending on a meta-parameter (that is, a parameter not found in the argument of any indicator, signal, or rule) called atrOrder (a boolean), I can choose which rule I wish to add to the strategy configuration. f) The order quantity (orderqty) is no order-sizing function is used. i) the arguments to the order-sizing function. j) There are other arguments to different order types, but we’ll focus on market orders for this post. 7) (Not shown) the label for the rule. If you’re interested in writing your demos as quickly as possible, these are not necessary if your entry and exit rules are your absolute final points of logic in your backtest. However, if you wish to look at your orders in detail, or use stop-losses/take-profit orders, then the rules need labels, as well. While most of the logic to adding your basic rule is almost always boilerplate outside the arguments to ruleSignal, it’s the arguments to ruleSignal that allow users to customize rules. The sigCol argument is a string that has the exact name of the signal column that you wish to use to generate your entries (or exits) from. This is the same string that went into the label argument of your add.signal function calls. 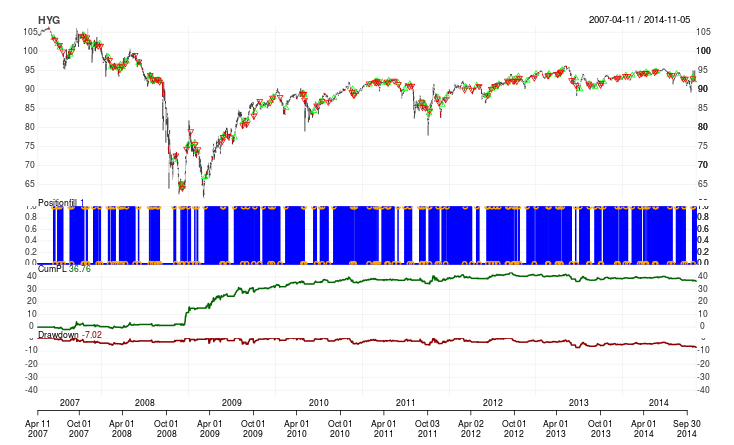 In quantstrat, labels effectively act as logical links between indicators, signals, rules, and more. The sigVal argument is what value to use to trigger rule logic. Since signal output (so far) is comprised of ones (TRUE) and zeroes (FALSE), I set my sigVal to TRUE. It is possible, however, to make a sigSum rule and then allow the sigVal argument to take other values. The ordertype argument is the order type. For most of my demos that I’ve presented thus far, I’ve mostly used “market” type orders, which are the simplest. Market orders execute at the next bar after receiving the signal. They do not execute on the signal bar, but the bar after the signal bar. On daily data, this might cause some P/L due to gaps, but on intraday data, the open of the next bar should be very similar to the close of current bar. One thing to note is that using monthly data, quantstrat uses current-bar execution. The orderside argument takes one of two values–“long” or “short”. This separates rule executions into two bins, such that long sells won’t work on short positions and vice versa. It also serves to add clarity and readability to strategy specifications. The replace argument functions in the following way: if TRUE, it overrides any other signal on the same day. Generally, I avoid ever setting this to true, as order sets (not shown in this post) exist deliberately to control order replacement. However, for some reason, it defaults to TRUE in quantstrat, so make sure to set it to FALSE whenever you write a strategy. The orderqty argument applies only when there’s no osFUN specified. It can take a flat value (E.G. 1, 2, 100, etc. ), or, when the rule type is “exit”, a quantity of “all”, to flatten a position. In all the sell rules I use in my demos, my strategies do not scale out of positions, but merely flatten them out. The prefer argument exists for specifying what aspect of a bar a trade will get in on. Quantstrat by default executes at the close of the next bar. I set this argument to “Open” instead to minimize the effect of the next bar transaction. The osFUN specifies the order-sizing function to use. Unlike the functions passed into the name arguments in quantstrat (for indicators, signals, or rules), the osFUN argument is actually a function object (that is, it’s the actual function, rather than its name) that gets passed in as an argument. Furthermore, and this is critical: all arguments *to* the order-sizing function must be passed into the arguments for ruleSignal. They are covered through the ellipsis functionality that most R functions include. The ellipsis means that additional arguments can be passed in, and these additional arguments usually correspond to functions used inside the original function that’s called. This, of course, has the potential to violate the black-box modular programming paradigm by assuming users know the inner-workings of pre-existing code, but it offers additional flexibility in instances such as these. So, to give an example, in my entry rule that uses the osDollarATR order-sizing function, arguments such as pctATR and tradeSize are not arguments to the ruleSignal function, but to the osDollarATR function. Nevertheless, the point to pass them in when constructing a quantstrat strategy is in the arguments to ruleSignal. If you do not wish to use an osFUN, simply use a flat quantity, such as 100, or if using exit type orders, use “all” to flatten a position. The type argument takes one of several values–but “enter” and “exit” are the most basic. They do exactly as they state. There are other rule types, such as “chain” (for stop-losses), which have their own mechanics, but for now, know that “enter” and “exit” are the two basic rules you need to get off the ground. The path.dep argument should always be TRUE for the ruleSignal function. Finally, add.rule also contains a label argument that I do not often use in my demos, as usually, my rules are the last point of my logic. 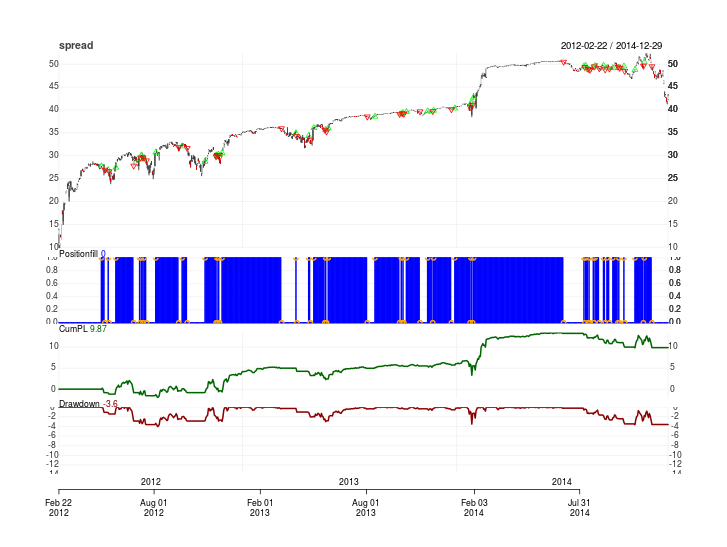 However, if one wants to do deeper strategy analysis using the order book, then using these labels is critical. As an explanation, I enclose the applyStrategy call in some code to print how much time the backtest took. Generally, on these twelve years of daily data, a single market may take between several seconds to thirty seconds (if a strategy has hundreds of trades per market). The next four lines essentially update the objects initialized in order of dependency: first the portfolio, then the account for a given date range (the duration of the backtest), and then compute the end equity. This concludes the basic nuts and bolts of creating a basic nuts and bolts strategy in quantstrat. On this blog, when I make more use of other features, I’ll dedicate other nuts and bolts sections so that readers can use all of quantstrat’s features more efficiently. This post will focus on signals in quantstrat. In comparison to indicators, signals in quantstrat are far more cut-and-dry, as they describe the interaction of indicators with each other–whether that indicator is simply the close price (“Close”), or a computed indicator, there are only so many ways indicators can interact, and the point of signals is to provide the user with a way of describing these relationships–is one greater than another, is the concern only when the cross occurs, does the indicator pass above or below a certain number, etc. 5) The label for the signal column, which is highly similar to the labeling for indicator columns. The first two steps are identical to the add.indicator step, except with add.signal instead of add.indicator. This is cut and dry. sigComparison, sigThreshold, sigAND, and sigCrossover. The arguments for all four are very similar. They contain some measure of columns, a threshold, a relationship between the first and second column (or between the first column and the threshold), and whether the signal should return TRUE for the entire duration of the relationship being true, or only on the first day, with the cross argument. Relationships are specified with a two or three character identifier: “gt” stands for greater than (E.G. SMA50 > SMA200), “gte” stands for greater than or equal to, “lt” and “lte” work similarly, and “eq” stands for equal to (which may be useful for certain logic statements such as “stock makes a new seven-day low”, which can be programmed by comparing the close to the running seven-day min, and checking for equality). The sigComparison function compares two columns, and will return TRUE (aka 1) so long as the specified relationship comparing the first column to the second holds. E.G. it will return 1 if you specify SMA50 > SMA200 for every timestamp (aka bar, for those using OHLC data) that the 50-day SMA is greater than the 200-day SMA. The sigComparison function is best used for setting up filters (EG the classic Close > SMA200 formation). This function takes two columns, and a relationship comparing the first to the second columns. The sigCrossover is identical to the above, except only returns TRUE on the timestamp (bar) that the relationship moves from FALSE to TRUE. E.G. going with the above example, you would only see TRUE the day that the SMA50 first crossed over the SMA200. The sigCrossover is useful for setting up buy or sell orders in trend-following strategies. The sigThreshold signal is identical to the two above signals (depending on whether cross is TRUE or FALSE), but instead uses a fixed quantity to compare one indicator to, passed in via the threshold argument. For instance, one can create a contrived example of an RSI buy order with a sigCrossover signal with an RSI indicator and an indicator that’s nothing but the same identical buy threshold all the way down, or one can use the sigThreshold function wherever oscillator-type indicators or uniform-value type indicators (E.G. indicators transformed with a percent rank), wherever all such indicators are involved. Lastly, the sigAND signal function, to be pedantic, can also be called colloquially as sigIntersect. It’s a signal function I wrote (from my IKTrading package) that checks if multiple signals (whether two or more) are true at the same time, and like the sigThreshold function, can be set to either return all times that the condition holds, or the first day only. I wrote sigAND so that users would be able to structurally tie up multiple signals, such as an RSI threshold cross coupled with a moving-average filter. While quantstrat does have a function called sigFormula, it involves quoted code evaluation, which I wish to minimize as much as possible. Furthermore, using sigAND allows users to escalate the cross clause, meaning that the signals that are used as columns can be written as comparisons, rather than as crosses. E.G. in this RSI 20/80 filtered on SMA200 strategy, I can simply compare if the RSI is less than 20, and only generate a buy rule at the timestamp after both RSI is less than 20 AND the close is greater than its SMA200. It doesn’t matter whether the close is above SMA200 and the RSI crosses under 20, or if the RSI was under 20, and the close crossed above its SMA200. Either combination will trigger the signal. One thing to note regarding columns passed as arguments to the signals: quantstrat will do its best to “take an educated guess” regarding which column the user attempts to refer to. For instance, when using daily data, the format may often be along the lines of XYZ.Open XYZ.High XYZ.Low XYZ.Close, so when “Close” is one of the arguments, quantstrat will make its best guess that the user means the XYZ.Close column. This is also, why, once again, I stress that reserved keywords (OHLC keywords, analogous tick data keywords) should not be used in labeling. Furthermore, unlike indicators, whose output will usually be something along the lines of FUNCTION_NAME.userLabel, labels for signals are as-is, so what one passes into the label argument is what one gets. 1) The first signal checks to see if the “Close” column is greater than (“gt”) the “sma” column (which had a setting of 200), and is labeled “filter”. 2) The second signal checks to see if the “rsi” column is less than (“lt”) the threshold of buyThresh (which was defined earlier as 20), and is labeled as “rsiLtThresh”. 3) The third signal checks when both of the above signals became TRUE for the first time, until one or the other condition becomes false, and is labeled as “longEntry”. NB: the signals themselves do not place the order–I just like to use the label “longEntry” as this allows code in the rules logic to be reused quicker. 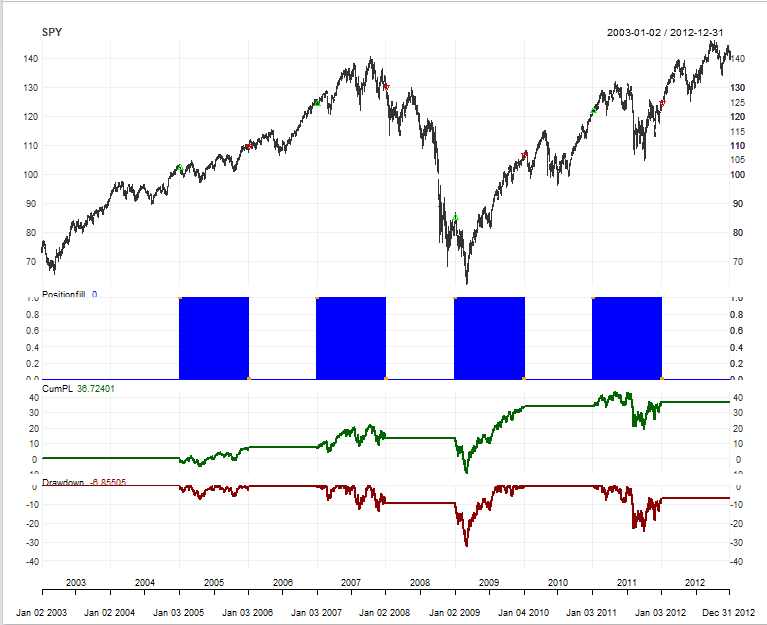 4) The fourth signal checks if the “rsi” column crossed over the sell threshold (80), and is labeled as “longExit”. 5) The fifth signal checks if the “Close” column crossed under the “sma” column, and is labeled “filterExit”. In quantstrat, it’s quite feasible to have multiple signals generate entry orders, and multiple signals generate exit orders. However, make sure that the labels are unique. The next post will cover rules.